Our cruising plans changed abruptly today. The headline news story here in Chattanooga is that the Chickamauga Lock has been closed. While inspecting the lock, a crack was discovered in one of the upper steel gates. The lock was immediately shut down for a minimum of three weeks and maybe longer depending on what they find. We had planned on heading downtown this weekend aboard IdyllTime but will for now remain tied to the dock. This closure could also potentially prevent us from heading south in December. The TN River is the fourth largest river in the US and carries a tremendous amount of commercial barge traffic as well as recreational boaters. The waters of the TN River and therefore our boating lives are controlled by a series of locks and dams. Franklin D. Roosevelt created the Tennessee Valley Authority (TVA) in 1933 as part of his New Deal. TVA erected a series of hydroelectric dams along the TN River for the purpose of power production, flood control, and navigation. 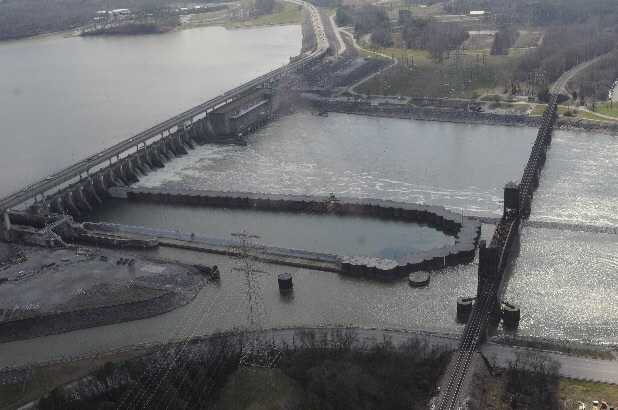 The locks are now operated and maintained by the U. S. Army Corp of Engineers while the hydroelectric dams are under TVA control. 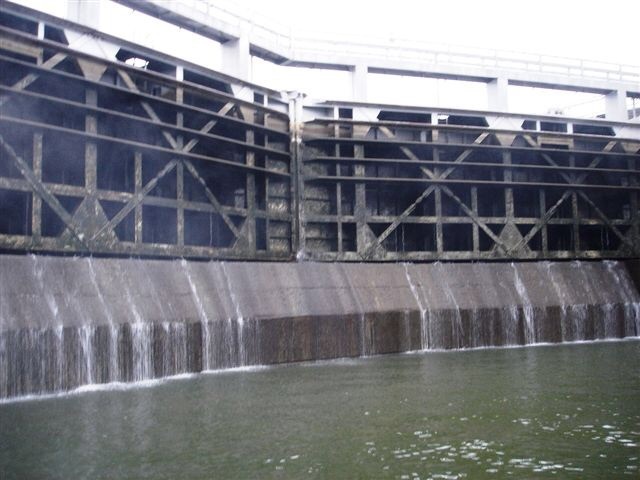 In the early 2000′s, an inspection of Chickamauga Lock discovered that the concrete inside the lock was deteriorating. The existing lock would be unsafe for use sometime before 2023. 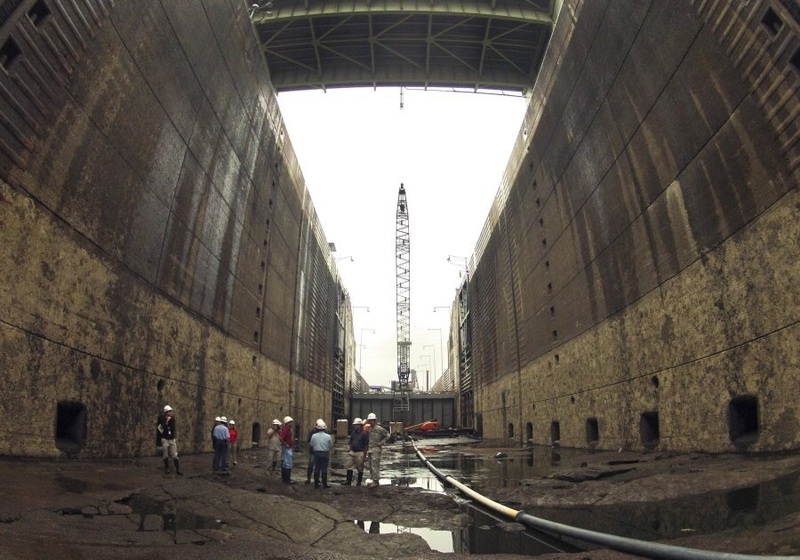 In 2003, a $375 million project to replace the lock was approved by Congress and construction was begun in 2005. The new lock was scheduled to open in 2014. Due to lack of funding by Congress, construction was halted in 2010, half way through the project. This project has sat idle for the last four years while waiting on new funding. Due to these delays the original $375 million cost has escalated to over $860 million. Because of it’s deteriorating condition, the Chickamauga Lock has become the most heavily inspected of any locks in the U.S. The Army Corp is now trying to determine if the cracked gate is due to the deteriorating concrete and if it can be repaired and safely reopened. Good news came this afternoon. After inspecting the lock, the Army Corp now feels that the cracked gate can be repaired and the lock should be back in operation within a week. Hopefully, this recent closure will be a wake up call to Congress and they will approve the funds necessary for repairs. Our fingers are crossed that no other problems are discovered before our departure in December. This entry was posted on November 1, 2014 at 1:40 pm. You can follow any responses to this entry through the RSS 2.0 feed. You can leave a response, or trackback from your own site.